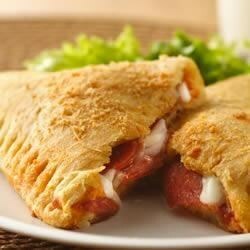 So this episode was about “Games on the Go,” and Jared joked that I should just do Hot Pockets for the recipe. Of course he meant the crappy freezer Hot Pockets that you put in the microwave – you know the ones, they are never fully cooked in the center. Yeah THOSE. Yuck. But, I decided it was still a fun idea. You can make homemade pizza pockets with crescent rolls, and they’re pretty good. I don’t know how “on the go” they are, though you can put them in a container and warm them up for lunch at work or something.